All dudley® products are built with the unmatched strength and durability that you've come to know and trust. Each lock is individually tested to ensure years of trouble-free operation. dudley® is more than just combination locks. dudley® offers new security options for your bike, snowboard, skateboard, skis, bags and even backpacks. 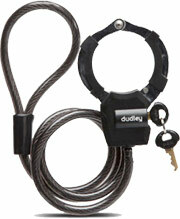 dudley® also offers you accessories for your locker. dudley® is the name you can trust for your on-the-go lifestyle.